Here’s a way to give your 3-5/8" bore shovelhead engine the nostalgic look of a pan, and improve performance at the same time. 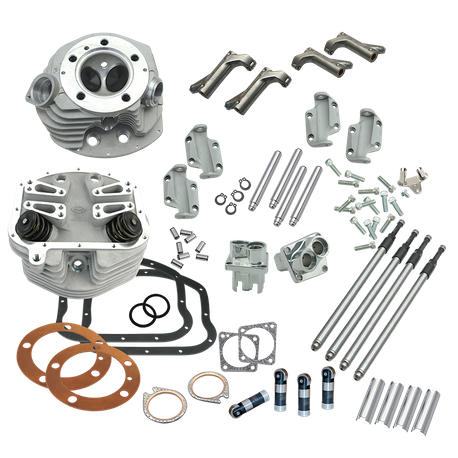 The Retro Cylinder Head and Valve Train Upgrade Kit consists of a set of S&S P-Series 3-5/8" dual plug cylinder heads with rocker cradles, S&S roller rocker arms, S&S hydraulic tappets, billet tappet guides, Quickee pushrods, pushrod cover clips, and the required gaskets and hardware for assembly. Fits 3-5/8" bore engines in Harley-Davidson® motorcycles. The S&S Retro Conversion Kit requires that a 1984-‘99 style cam be used to ensure correct valve timing due to the roller size on the late style tappets use in the kit. 1970-’77 stock engines will also require a 1978-’87 style pinion gear to mate with the late style cam gear. 1966-’69 engines or other engines with generator style crankcases will require a special generator style cam with 1984-’99 style lobes. See chart for recommendation. 1979-’84 o-ring style pushrod covers are required; S&S part #93-4040 or equivalent. Not legal for sale or use on CA or EPA pollution controlled vehicles 1978 and later.